Some suggest the building got its pink color because the color and other design elements were borrowed from the Royal Hawaiian Hotel down in Waikīkī. Let’s step back a bit. In 1898, the Spanish American war was going on, including in the Pacific (primarily in the Philippines) – Hawaiʻi became involved. The US Army set up Camp McKinley in Kapiʻolani Park and soon realized an urgent need for a hospital in Hawaiʻi. The Army’s first medical facility in Hawaiian Islands opened in 1898; it was a 30-bed hospital for soldiers and sailors in transit to and from Manila located in the Independence Park Pavilion (an old dance pavilion at the intersection of King Street and Sheridan.) Field medical tents at Fort McKinley added support to the hospital. Casualties were streaming into Hawaiʻi from the war in the Philippines. The hospital on King Street rapidly grew into a 100-bed operation and was visited by more than 21,000 troops during the Philippine Insurrection following the war with Spain. Later, in 1907, Department Hospital, a wooden post hospital facility consisting of a single hospital building and mess hall, was constructed at Fort Shafter. Then, the US Army Health Clinic, Schofield Barracks, a 500-bed hospital, was completed in 1929. It was activated as the Station Hospital, Schofield Barracks, Territory of Hawaiʻi. The attack on Pearl Harbor led to the construction of Tripler Army Medical Center. At the outbreak of World War II, the hospital at Fort Shafter had a 450-bed capacity which, over the years, expanded to 1,000 beds through the addition of one-story barracks-type buildings. Plans for a new Tripler hospital atop Moanalua ridge were drawn in 1942, construction was authorized in June 1944; the ground was broken August 23, 1944; actual construction began in 1945: and construction was completed in 1948. Tripler was dedicated on September 10, 1948 and has been a visible and valuable landmark in Hawaiʻi. It is the largest military medical treatment facility in the entire Pacific Basin. In 1961, Tripler US Army Hospital became known as US Army Tripler General Hospital, and finally in 1964, the name changed to Tripler Army Medical Center. In a cooperative agreement with the Department of Veterans Affairs in 1992, the Spark M Matsunaga Medical Center was added at Tripler. Nearly 800,000-beneficiaries in the Pacific Basin are eligible to receive care at Tripler; this includes active-duty service members of all branches of service, their eligible families, military-eligible retirees and their families, veterans, and many residents of Pacific Islands. 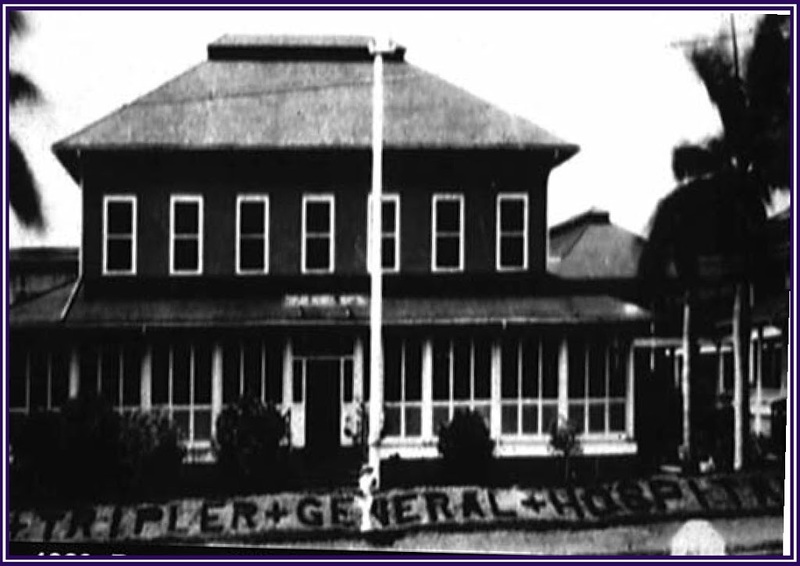 The image shows the initial Tripler Hospital at Fort Shafter (army-mil.) In addition, I have added other related images in a folder of like name in the Photos section on my Facebook and Google+ pages. I was born at Tripler Hospital in 1950. I vaguely remember a picture of Tripler my family had of the hospital as concrete gray. When did it get its distinctive “flamingo” pink color?